Most applications discussed in the previous chapters are based on the rigid link (body) assumption. However, mechanical structures are flexible in nature. Rigidity is only an approximation when the flexibility is ignorable. In robotic applications, lightweight arms are always desirable due to their cost advantages, and long arms are needed for certain applications ranging from the assembly tasks of the International Space Station (ISS) to aircraft cleaning tasks. When either lightweight or long arms are used, the flexibility shows up inevitably regardless of the materials the arm is made of. This fact can be seen from the Euler-Bernoulli equation which implies that the static deformation of a uniform cantilever beam subject to a force at its free end is proportional to the third power of the beam length. 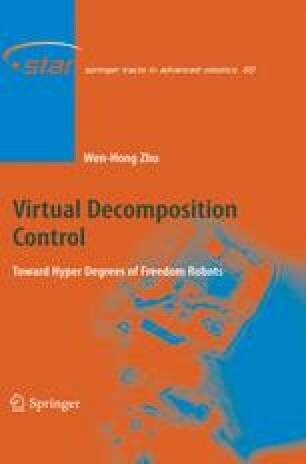 By restricting robot control design to rigid models, the operational efficiency can be severely affected due to the extra time needed to damp out vibrations for safe executions of robotic tasks. This situation technically motivates the need of developing appropriate control approaches for flexible link robots.